November 18, 2017 Raleigh, NC What a wonderful and festive time in Raleigh. 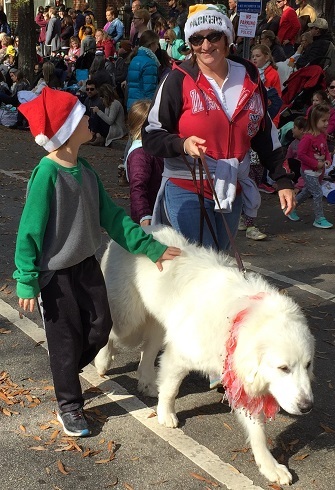 There was simply Pyrfect weather as tens of thousands of cheering and waving people lined the streets of downtown Raleigh for the annual Christmas Parade. The event typically ranks as one of the largest on the East Coast. This year there were 115 entries including marching bands, festive floats, giant balloons, animals, entertainers, special vehicles, and of course Santa Claus. September 30, 2017 Kerr Lake, NC The Research Triangle Park Great Pyrenees Club held their fall membership meeting at Kerr Lake on September 30, 2017 in association with a club picnic. We were blessed with a beautiful, sunny and cooler day and the members, two legged and four legged alike, were able to enjoy the beautiful lakeside pavilion.